Lee Valley (LV) describes the Bevel Up Smoother (BUS) as “our state-of-the-art pure smoothing plane. It is the plane to use for the final finish on surfaces, especially woods of difficult grain patterns”. The BUS has been dubbed by LV as the 164-1/2 H. This refers to its being a larger, heavier version of the #164, a low angle plane produced by Stanley in 1926, and recently reintroduced by Lie Nielson and Lee Valley, the latter’s version being the Low Angle Smoother (LAS). To position the #164 (LAS) and #164-1/2 H (BUS), the bench plane equivalents are the #4 and #4 ½ sizes, respectively. 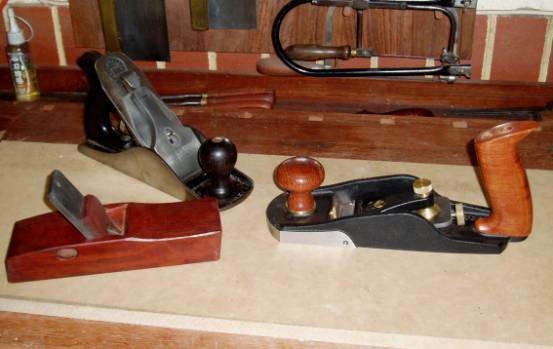 This factor is particularly pertinent when you consider that Patrick Leach is convinced that Stanley produced the #4 ½ bench plane in 1884 to compete with the heavy English infill smoother, which most handplane aficionados would no doubt consider to be the ultimate example of this form of handplane. So what desirable characteristics does this high-end smoother demonstrate? High body mass for its length (the BUS is the same length as the lower weight LAS yet weighs about 40% more. This is greater than the original Stanley #4 ½). It is designed with a low centre of gravity. This is a combination of the bevel up design (i.e. the bed angle is a low 12°, and the cutting angle is obtained from the bevel angle of the blade’s cutting edge), and the low, squat design of the plane body. A thick blade (3/16”) to aid stability and reduce the possibility of chatter. This is made of A2 tool steel hardened to Rc60-62. A wide range of effective cutting angles, especially very high angles. The BUS comes standard with a 38° bevel, which yields an effective cutting angle of 50° (i.e. a York pitch). However, it is possible to alter the cutting angle by using blades with different bevels (indeed, the BUS shares blades with the LA Jack and the BU Jointer, and this makes it possible to more easily cover a wide range of bevel angles). A very successful setup is a 50° bevel for a 62° effective cutting angle (For those who have not familiar with the advantages of high effective cutting angles, the research of Lyn J. Mangiameli is essential reading). With its adjustable mouth it has the capability to be set up for the finest of shavings. o (2) A long and wide bed that supports the blade down to the mouth. A substantial front knob and rear tote. The rear tote has double bolts for additional rigidity, compared to traditional bench planes such as the Stanley, which use only one bolt. Precise blade adjustment (through a Norris-style adjuster). Blade adjustment is in two planes – blade projection and lateral adjustment. 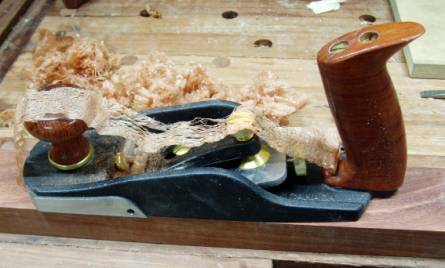 About a year ago, during the time I was assessing the LV LA Jack Plane (which, as with the BUS reviewed here, was supplied by Lee Valley for purposes of feedback and evaluation), I became so impressed with its potential and capabilities that I purchased the LV LA Smoother. Up until that time my favourite smoother was the HNT Gordon. These two planes have a few features in common. Firstly, I use them both exclusively in high angle configuration to deal with the difficult figure and grain of Australian hardwoods. And secondly, both are relatively light planes. It is the latter factor that is of particular interest here since one of the defining features of the LV BUS is its high mass. 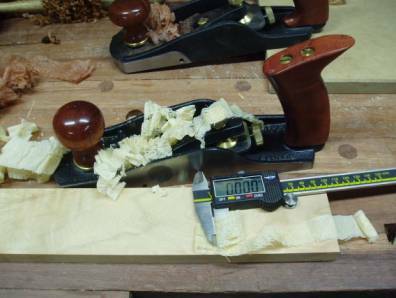 I have long tended to prefer lighter planes: in addition to the LA Smoother and HNT Gordon smoother, I also use a Mujingfang smoother and a Stanley #604 Bed Rock. 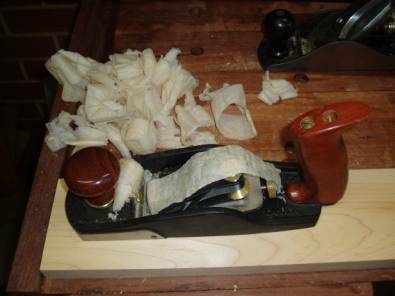 I do have a few heavy smoothers, such as a Stanley # 4 ½ and a Norris-type unhandled infill. One might even include the LV LA Jack, which is really more technically a panel plane. These are all very capable planes but for me lack “feel”. For this reason, when I heard about the development of the BUS, it really did not set my pulse racing. It did raise a few questions, however – one in particular that I imagine has been raised by others, that being whether to purchase the LAS or the BUS? Question: does the extra heft of the BUS really play a significant role in its performance? Question: is the BUS a step up from the LAS? The BUS was assessed in two cutting angle configurations. Firstly, it was set up and used with a cutting angle of 45° since this is the Standard Angle configuration of the Stanley #4½. Secondly, it was set up with a cutting angle of 62°, the closest setting on the LV Honing Guide Mk II to the 60° High Angle configuration of the HNT Gordon. 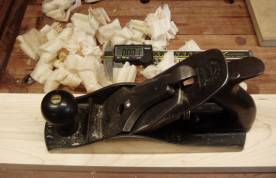 (a) Investigation #1: To determine the planing quality of the BUS, it was matched with a similar handplane, a vintage Stanley #4½ (Type 12). To reduce conflicting variables, the two planes were matched as closely as possible in size, weight, effective cutting angle, and size of mouth. 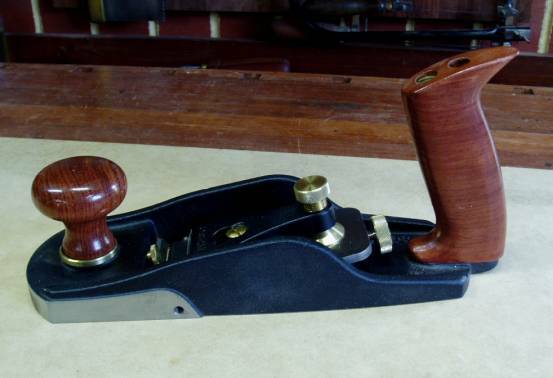 This #4 ½ was a fine example of a fettled and tuned vintage bench plane, and its performance was further upgraded with the addition of the substantial Clifton 1/8” thick blade and two-piece chipbreaker. This increased the plane’s weight to equal that of the BUS. The effective cutting angle for the #4 ½ and the BUS was 45°. Blades were honed to 8000 (1.2 microns) on a King waterstone using a LV Honing Guide Mk II for reliability of bevel angle. Both planes were carefully set up with the smallest mouth size that could still produce wide shavings. These were measured with a digital micrometer. 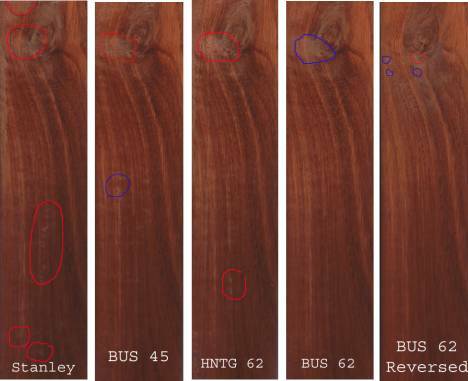 The identical selection of timbers was used for each plane, and the results recorded on a scanner at 600 dpi. The remaining difference between the two planes was the orientation of the blade, since the #4 ½ cuts bevel down. It was hoped that this would provide insight into the experience and use of low- verses high centre of gravity set-ups. 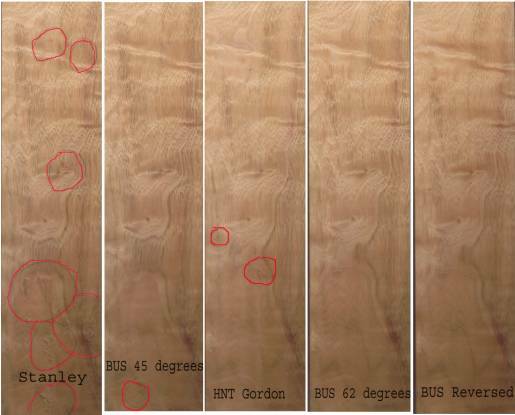 (b) Investigation #2: To determine the input of effective cutting angle, the same timbers were planed with the BUS in high angle mode, here an effective cutting angle of 62°. This was compared with the HNT Gordon smoother, with a 60° effective cutting angle (it would have been possible to add a 2° back bevel, but I was concerned that this might increase the size of the finely set mouth, which is non-adjustable). The Australian HNT Gordon Smoother (Ironwood version) is a high angle bevel down plane designed to tackle to most difficult Australian timber, particularly hardwoods with interlinked grain. The most obvious difference from the other planes here is that this is a wooden plane and that the blade is held in with a wedge. Adjustments of the blade are made with a mallet. (c) Investigation #3: To determine the input of mass, the BUS was later compared with the LV LA Smoother (LAS). Both used a high angle setting. Since my earlier comments pointed as much to the subjective experience – “the feel” – of differing masses, both this and an objective measure of planing ability was scrutinized. The LAS is essentially a smaller version of the BUS, being nominally a #4 size. Here are the initial contestants. HNT Gordon Smoother, Stanley #4 ½, and LV Bevel Up Smoother. The timbers in this review, all from the USA and Australia, were chosen to represent a hardness range typical of that used by many woodworkers. While technically they are all hardwoods, the Cherry (USA) and Camphor (Australia) would be viewed here as falling in the softer range (sp gravities .58 and .59 respectively), with Mahogany and Maple (both USA) falling into the middle range (sp gravities .64 and .72), and Jarrah and Karri (both Australia) the hard range (sp gravities .80 and .88). 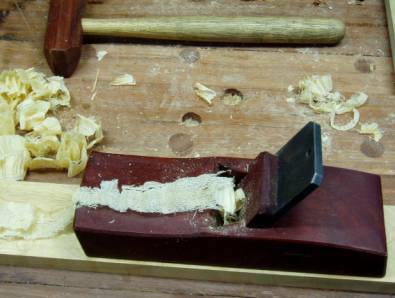 These timbers had been part of the review written on the LV Scrub plane. They were flat, square and had been finished with either a HNT Gordon Try Plane or LV Bevel Up Jointer. The Jarrah had been additionally smoothed with card scrapers to remove some tear out. Basically, the cutting angle of a bevel up plane is the bevel angle plus the bed angle, while the cutting angle of the bevel down plane is determined by the angle of the frog only. Since the Stanley’s cutting angle is, therefore, limited to 45° (excluding the possible addition of a back bevel), the BUS was used with two blades, a 33 degree° bevel (creating a cutting angle of 45 degrees, the BUS-45), and a high angle 50° bevel (creating a cutting angle of 62°, the BUS-62). 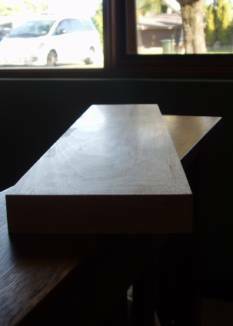 The high angle is better suited to hardwoods and timber with interlinked grain, and this bevel angle was essentially the same as the 60° bed of the HNT Gordon (HNTG). All blades were honed through a progression of grits to 1.2 microns on an 8000 King waterstone. The LV Honing Guide Mk II was used in this regard since this made it easier to create reliably accurate bevel angles. While the quality of the planed surface is really the measure of how well the total smoother package is working, one of the popular tests is how thin are the shavings. A reasonably thin shaving is .002” thick, with .001” being the product of a well-tuned smoother. The planes here were all capable of doing a good bit better than this. The HNT Gordon did not achieve quite the same degree of fine shavings. 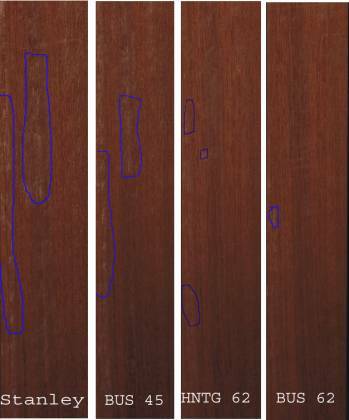 Below are examples of fine wisps of Jarrah being measured at .002” (upper picture) and Camphor at .001” (lower picture). 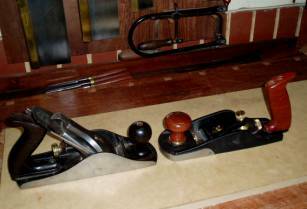 Compared to the Stanley and HNT Gordon, it was evident that the BUS was in a class of its own when it came to setting and fine-tuning the blade. 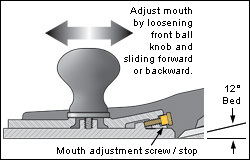 With the BUS you slide the adjustable mouth forward (to guard against the blade edge striking a metal surface), place the blade on the plane’s bed between the set screws, replace the lever cap, return the sliding mouth to its preset position, then fine-tune the blade for square and projection. With the Stanley, you must first re-position the chipbreaker on the blade as close to the edge as you can, place the blade on the plane’s frog, carefully attempting to centre the lateral adjustment level, replace the lever cap, then fine-tune the blade. While these steps appear very similar, they are so much fiddlier with the Stanley. For example, the setscrews on the BUS permit the blade to be placed in the same position as before. The adjustable mouth has a stop that returns it to the same projection as before. 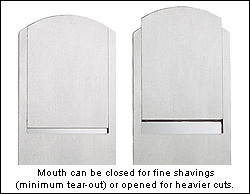 It is possible to get very close to the previous depth of cut by extending the blade to the edge of the mouth. With the Stanley, many things may go wrong. If the chipbreaker is set a fraction to far forward or too far back, it will impact on the depth of cut setting. If the chipbreaker is not centered on the screw in the middle of the frog, the lateral adjustment lever will be skewed more to one side than another, making it more difficult to adjust to centre. 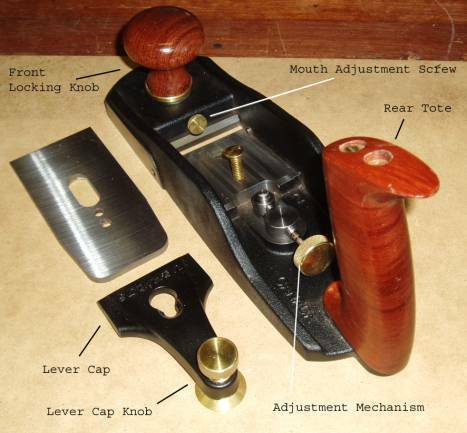 Setting the mouth size on a Stanley bench plane requires removal of the frog (since the adjustment screws are positioned under the blade), followed with a trial-and-error approach to get the desired setting. Bed Rocks are partly desired for their ability to by-pass this last stage (as they have external adjustment screws). Backlash is the term given to the amount of free play in the adjustment mechanisms. The Stanley required 3 ¼ revolutions of the height adjusting knob to produce movement. The BUS required a ¼ revolution. After the Stanley, it is almost a pleasure to adjust the HNT Gordon! Place the plane on a flat hardwood surface, slide in the blade until it gently touches this surface, press in the wedge and tap it gently into place. The plane may now be ready for use. Adjustments are made with mallet taps to the rear (raise the blade), top of blade (lower the blade), and sides (for lateral adjustment). This process does require a little practice, but is easier than perceived by the novice. Neither the Stanley nor the HNT Gordon could match the BUS for ease of clearing the mouth of shavings. On the BUS you simply release the adjustable mouth, slide it forward, clear the shavings, then return the mouth to the position set by the stop screw. This takes about 2 seconds. With the Stanley and the HNT Gordon one might, at best, poke a pointy thing into the opening or, at worst, have to remove the blade to clear a jammed mouth. 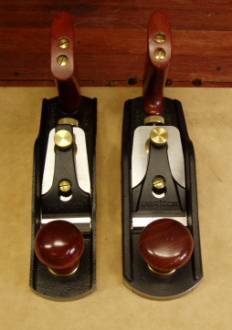 The Mahogany, Maple and Cherry proved to be non-challenging timbers for the Stanley and BUS-45. All of these timbers planed like butter. None revealed the slightest hint of tear out. The only difference between the Stanley and BUS-45 was a subjective one. The BUS-45 appeared to produce a slightly shinier finish than that by the Stanley. This was not considered significant, however, since a coat of oil or wax would likely obscure it. Reflections on Mahogany (left) and Maple (right) following the BUS-45. It was the Camphor, Jarrah and Karri that sorted the boys out from the men (to use a rather politically incorrect term). (a) The Camphor tree is a native of Asia and has become widely naturalized in Australia and the USA. It is a softish wood with a creamy white appearance and, at times, it has spectacular figure, which is its main attraction. While it cuts easily, it presents an enormous challenge to the woodworker since the grain can run wild, even reversing itself several times in the space of a few inches. Handplaning is difficult, to say the least. All red outlines indicate evidence of tear out. These results reveal that the Stanley demonstrated the poorest ability to control tear out in the Camphor. Next worst was the HNT Gordon, although its performance was reasonably good by comparison to the Stanley. The BUS-45 produced a better finish than the HNT Gordon in spite of having a lower angle blade. In my opinion, this was due to having the ability to reduce the size of the mouth and take finer shavings. The clear winner here was the BUS-62. 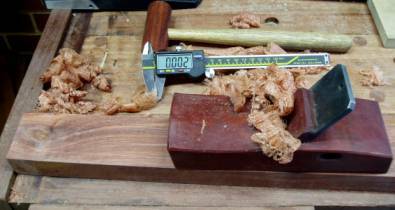 Not only did it produce a flawless performance on the Camphor, but repeated this even when planing against the grain. 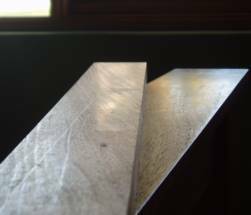 The only visible difference between the surfaces planed with- and against the grain with the BUS-62 was that the latter was more matt than shiny in appearance. (b) The Karri tree belongs to a group of giant eucalyptus trees that grow in Western Australia to a height of around 300 ft (90m). They are prized for their extreme toughness. 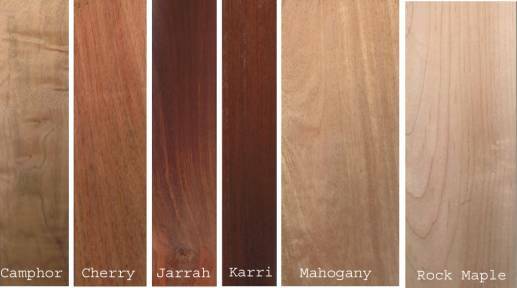 Similar in appearance to Jarrah, this is a very dense timber with considerable interlinked grain. 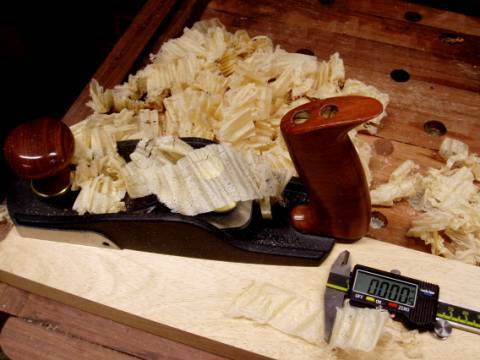 In my experience, this rates very high as a timber that is difficult to plane without tear out, although this tends to take the form of pseudo-tear out. All blue outlines indicate surface abrasion (pseudo-tear out). Again the Stanley is poorest, followed more closely this time by the BUS-45. The difference in the results achieved most likely reflects in part the input of the higher cutting angles of the HNT Gordon (second best performance) and BUS-62 (best performance. (c) The Jarrah tree is another Eucalypt native of Western Australia. It is redder in tone than Karri and has a wider range of hues and grain. Its timber is sought after for cabinet making, flooring and paneling and is so dense that it is resistant to termites. Before the era of bitumen roads, famous roads in cities such as London and Berlin were paved with blocks of Jarrah. All blue outlines indicate surface abrasion ( pseudo-tear out). The common difficulty that all the planes experience was smoothing the area around the knot. Clearly, 45° is insufficient as a cutting angle, even with the small mouth of the BUS-45. The HNT Gordon faired a little less well that the BUS-45. It produced slightly more tear out around the knot and, subjectively, the timber surface was not as clear. The BUS-62 produced a near-perfect finish. The only exception was the pseudo-tear out around the knot. This would be expected to be difficult to detect with a little scraping and the applied finish. Interestingly, when the timber was reversed and the BUS-62 planed into the grain, the area around the knot improved. Evidently the grain in this area was also reversed. Importantly, the BUS-62 displayed impressive ability to control the difficult grain of the Jarrah board regardless of its direction. As with the Camphor, the BUS-62 was capable of near-flawless planing with or even against the grain. Is it true that bigger is better? It is time to compare the BUS with the LAS. I recall when the BUS arrived and I removed it from its box. Compared to the LAS it looked squat and ungainly. And heavy. Did I mention it felt much heavier than the LAS? Or that it had a thicker, more cumbersome handle? I was determined not to like this interloper. Of course I had to try it out. I am only made of flesh and blood. So, with a freshly honed and carefully set blade in a minute mouth … take one Cherry board ……place the BUS down on the timber. It feels as squat as it looks – like a suction on a glass plate. It feels low. Mmmm…it “feels” lower than the LAS. 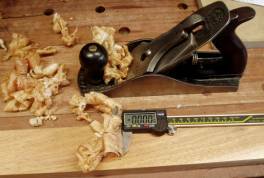 About a month ago I reviewed the LV Scrub plane and complained about the thickness of the rear tote. The BUS has the same rear tote. This time I barely noticed it. A short aside about the rear tote….. I have been using the BU Jointer for the past month. 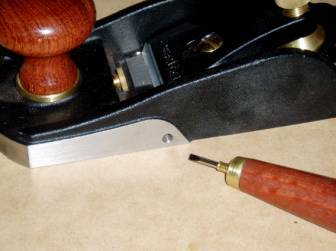 It is just a superb instrument and totally outperforms every jointer I have used to date. My head had really been with the BU Smoother review I am finishing, but the Jointer gave me pause for thought in regard to the rear totes. While I still find the centre of the tote too thick for my personal tastes, it had been less of an issue than with the LV Scrub. It occurred to me that I was also not so fussed with the tote when using the BU Smoother. The question was why? The answer may have a lot to do with the weight of these planes and the momentum they achieve compared to a lighter plane. My workbench is moderately high - 35 ½ “ - compared to those of Frank Klausz at 33” (since Frank is 6’0” tall, this bench is clearly very low) and Ian Kirby at 34” (he is 5’9”, about an inch shorter than myself). (information available from The Workbench Book by Scott Landis). It was built many years ago and before I thought to dedicate it to handtool use. 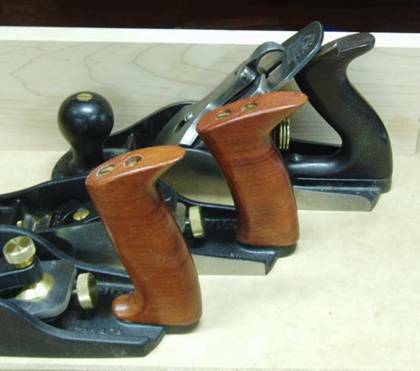 It occurred to me that the smaller and lighter planes (such as the LA Smoother) require more down force, and that the thinner totes permit me a tighter grip to control them. Perhaps higher benches are better suited to planes that require less downforce? The second factor is the angle of the tote (according to my protractor, approximately 80° for the LV and 50° for the Stanley). The angles of the LAS and BUS are the same, but significantly more upright (vertical) than the Stanley. What is the effect of this? Once again it appeared to me that the Stanley tote was designed for a different bench height (and a different era of handplaning) than the LV. More downforce may have been applied to the Stanley because benches were lower. By contrast, the natural orientation of the LV seems to be that of forward, that is, in the horizontal, and this seems to be better suited to taller benches (modern benches designed for both hand- and power tools?). What of the front knob? The mushroom knob of the BUS is very comfortable easy to hold. It reminds me a little of the low Stanley knobs of the Type 11 and earlier era. The front knob of the LAS is smaller and more akin to modern Stanley knobs. It is also comfortable. Why are knobs round? Probably because this permits them to be held at different angles. Why does the BUS have a larger knob that the LAS? Probably because it is heavier and requires extra leverage to lift at the end of a stroke. The knobs meet different needs in different circumstances. In my opinion they suit the planes they are on. Back to the BUS and the Cherry board…. I push the plane…. It feels like a train on tracks….. It gains momentum and it seems as if nothing can stand in its path….. It feels quite effortless – quite a different sensation to both the LAS and HNT Gordon. The latter planes need to be pressed down onto the surface. The BUS just needs to be pushed forward – its weight provides all the needed pressure downward. Now the LAS is capable of as superb a finish as the BUS. Its performance was measured on the Camphor. See the pictures below. There is a difference, nonetheless. It is simply that with the BUS it is less effort to produce these results. Compared to the LAS, what the BUS lacks in “feel” it makes up in control. With its sole waxed, it has all the speed that one could wish for and, in this situation, it did not feel heavy. So which do I do prefer? For the majority of the smoothing, especially that involving hardwoods, I will turn to the BUS. Does this mean that the LAS has been superceded? Definitely not - where boards are smaller, particularly where surfaces are narrower and feel is desired, then the LAS will come into its own and be preferred. Not only that, the LAS has a wide range of uses. For example, it is a superior plane on a shooting board. The BUS cannot be used on a shooting board. The owner of a BUS will have this option covered and be seeking this plane as an ultimate, dedicated smoother. The LV Bevel Up Smoother is a superior plane and earns the right to be short-listed by those seeking a dedicated smoother. About a year ago I became a convert to the promise offered by the bevel up plane design. Now I am a convert to a heavy smoother. I wonder what further changes the future holds in store?